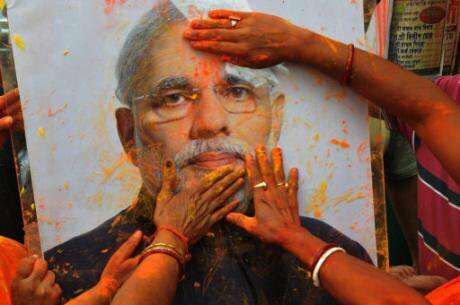 BJP supporters celebrate Holi around a Narendra Modi photograph after the Uttar Pradesh Assembly election results are announced.NurPhoto/SIPA USA/Press Association. All rights reserved.Any foreign correspondent who came to India to cover the state elections must stay on to report on this land of miracles. Prime Minister Narendra Modi is being called ‘Magic Man’ after he won the largest state of Uttar Pradesh (UP) for his Hindu nationalist party, the BJP. The voters gave an overwhelming mandate to Modi who was not a candidate. He was elected to Parliament in the 2014 elections from UP’s world-famous temple town of Varanasi, but he did not leave this election campaign to the state-level leaders. The Prime Minister kept going from New Delhi and addressing public rallies in UP. He camped there for three days, visiting temples and holding road shows that dominated the TV screens. Modi attacked political opponents in blunt words that were lapped up by his listeners. He conveyed messages to the poor. He appealed to the Hindus by blaming the State Government for its appeasement of the Muslims. Modi faced a formidable challenge because his de-monetisation move had caused hardship to millions of poor apart from inconveniencing the rich. It had led to the closure of thousands of small industrial units. But Modi called it a sacrifice for the nation and his voters seem to have agreed. Modi called it a sacrifice for the nation and his voters seem to have agreed. The UP voters don’t care if Modi’s irresistible rise frightens the defenders of democracy, fighters for free speech and soldiers of secularism. Some of the BJP leaders and its student wing question the concept of free speech in the TV studios and through their street violence. Modi has been facing protests by the liberals, intellectuals, writers and artists, and a major section of the student community who are deeply disturbed by the atmosphere of intolerance in which free speech invites violence. The section of the media not beholden to the Modi Government or the corporates reminds the nation about Hitler’s Germany. Talking of Hitler seems a bit far-fetched at this juncture even though some fascist tendencies keep coming to the fore. The UP elections however, did display both the strengths and weaknesses of the Indian democracy. Talking of Hitler seems a bit far-fetched at this juncture even though some fascist tendencies keep coming to the fore. The marginal sections feel empowered and gain developmental benefits because elections are held regularly. The latest massive exercise was conducted peacefully. Hate speech will subside after the elections. Of course, the nation is yet to diminish the role of money and muscle power and a large number of candidates facing criminal cases continue to win elections. It was no ordinary victory for Modi. His party had not ruled the state for more than two decades. Thus when the BJP dislodged the young socialist chief minister of the state, it seemed like a magical trick. Derided by significant sections, Modi acquired in popular imagination the status of the Super Man. The “Modi wave” delivered more striking results in the poll than even the earlier “wave of Lord Ram” that had swept UP following the BJP’s campaign to build a Ram temple in place of a mosque in the same UP. Religious polarisation was witnessed then, but even the temple campaign could not lead to the consolidation of the Hindu votes to this extent. This comparison has been made in the media and till going to the press, the Hindus based in America or the UK have not taken umbrage at the belittling of Lord Ram compared to Modi. The product that Modi sold so successfully to the voters of UP can best be described as Modi Plus. He offered something to every one. If that required ideological compromises or shaking hands with the enemies of yesteryear, so be it. While Modi’s latest feat is most impressive, he is not new to divining an effective political strategy. No one can beat him as a hidden persuader. He won a Gujarat state election by attacking the then military ruler of Pakistan by calling him “Mian” Musharraf. No one can beat him as a hidden persuader. Modi wins over masses by appearing in multiple personas, pleasing rival sections of the voters at the same time. Depending on the need of the hour and the audience and the district, he appears as a leader committed to development or as a leader pitted against the Muslims in order to remain the “Emperor of Hindu Hearts”! As this writer wrote in this journal two years ago: “Lord Shiva is one God who assimilates in his person all contradictions/ Modi did the same… Modi has a divine trait. God is perceived by the devotees as per their feelings, says a Hindi poet.” During the UP poll campaign too, the people saw the Modi as they wanted to see. 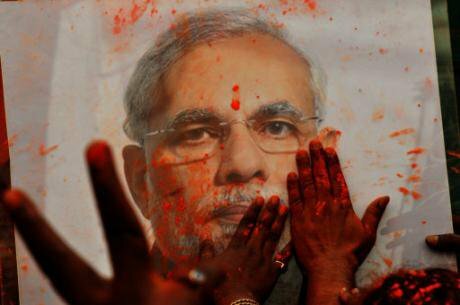 Modi’s core constituency fed on the anti-minorities rhetoric had no alternative. The sectarian Hindus felt elated that his party did not field a single Muslim candidate in the election. Many more Hindu voters felt attracted by Modi when he launched veiled attacks against the state government for appeasing the Muslims at the cost of the Hindus! Modi went on to attract other voters in large numbers by selling development dreams. The poor felt that he would fix the rich as he claimed to have done through de-monetisation! The rich corporates felt that once Modi’s party ruled UP, the state Government will shower them with plenty of incentives and subsidies as Modi had done while running the state of Gujarat. Modi wins over masses by appearing in multiple personas, pleasing rival sections of the voters at the same time. Many wavering voters were swayed by Modi’s oratory and cheap digs at his opponents. In small towns, the people derive comfort and entertainment from the oratory of the religious preachers in temple compounds and the lizard-oil sellers on the footpath. Thus political rallies are always a big draw in India. The ingredients of Modi’s magic potion are not hard to detect if his poll campaign is analysed. Modi knows his Indians better than any mass psychologist. He deftly exploits the social and economic fault lines to expand the social base of his party whose appeal was restricted to the middle-class trading community and upper castes. The UP campaign also tapped the fault line of economic rivalry. Statements were made to fuel antagonism based on religion, caste, sub-castes and class. No communist leader seeks to fuel class conflict in such a blatant way. But Modi wanted to appear as pro-poor. If the political opponent belonged to one sub-caste, the BJP hugged the leaders of rival sub-castes. No communist leader seeks to fuel class conflict in such a blatant way. Narendra Modi set out to transform India and he has already transformed the BJP. His victory in 2014 and now in the UP state elections show how effectively he has enlarged the social base of his party. He has expanded the area of the BJP’s influence. It has established itself in areas it has never reached before. The campaign control rooms of the BJP could perhaps beat Google in their access to the data related to the voters, the party’s campaigners and the opponents. Just count the tweets, videos, social media likes in favour of the BJP. The Gujaratis excel in their organizing ability. The institutions of Gujarat can run massive relief operation at a very short notice, a temple can organise a feast for 10,000 people in a day! This efficiency saves lives and serves the people well in times of drought, floods or earthquakes. But one also recalls that the groups who went to torch homes and shops during communal riots in Ahmedabad had computerised lists of the owners and their religious affiliation. Add this organizing power to the charisma of the leader while analysing Modi’s winning formula. BJP runs an ideologically-fired huge cadre and a team of voluntary and hired experts who operate with what is known as “western” efficiency. It can be marked out in an “oriental” atmosphere in which many district offices of the rival parties come to life only during the election season. It is the same with the activists of the non-BJP parties. So one cannot question Modi’s claim about “hard work” even though he used this phrase to deride the Harvard economists including Amartya Sen who had the temerity to criticise the Prime Minister’s de-monetisation scheme. One wonders about the sheer enormity of Modi’s achievement and its consequences for the nation. This transformation of the political scenario signifies changes that will last far beyond the term of the new state government. By wresting the politically most influential state from his opponents, Modi emerges as a leader powerful enough to modify the “idea of India”, a long-term objective of his party and its mentor, RSS, who hate the Nehruvian ethos. Detracting from India’s first Prime Minister who kept the communal forces at bay has been Modi’s top priority. Since his party had no heroes, he was quick to co-opt some Congress leaders even though they were opposed to the ideology of Modi’s parent party. A cartoonist describes this trick as collecting stolen idols. A cartoonist describes this trick as collecting stolen idols. As part of the anti-Nehru crusade, the Modi Government has tinkered with the institutions named after Nehru and inspired his Hindu fans living in America to unleash an anti-Nehru campaign. No nation seeks to demolish its heroes in this fashion. Modi, who punctuates his cheap digs against his political opponents with a rare dignified Prime Ministerial statement (Trump can learn from him), is today in a position to get away with anything. He is bathed in public adoration that demonstrates the growing appeal of muscular Hinduism, majoritarianism, politicised nationalism and a neo-liberal development model under which the big corporates get large subsidies and big incentives. His new pro-poor rhetoric has robbed his opponents of their main political weapon. His flaunting of the welfare measures does not frighten either the capitalists or the conservative economists who ignore the distributive justice and the concept of public goods. The pro-poor rhetoric does not obstruct the speedy privatisation in the critical sectors of health, housing and education. His new pro-poor rhetoric has robbed his opponents of their main political weapon. The BJP challenges secularism by raising the bogey of Muslim appeasement. When its storm-troopers make most atrocious sectarian statements, the Prime Minister remains silent. The parties wedded to secularism hesitate to confront him on this score as they have been intimidated by the BJP’s appeal to Hindu sensibilities. They refrain from offering an effective counter-narrative. The pro-poor rhetoric does not obstruct the speedy privatisation in the critical sectors of health, housing and education. The secular political formations will find it hard to cleanse society of the communal poison infused in recent years. The sectarian card yields political dividends at certain times. But BJP tones down its communal rhetoric when it sees that it is not working. The BJP will continue to play the Hindu card, unless a truly Hindu leader emerges to unleash a cultural revolution that challenges bigotry and fake nationalism. Modi’s supporters now feel confident that the people will reward their leader with yet another term as the Prime Minister and all opposition will be crushed. So Modi is justified in starting a campaign for his re-election as the Prime Minister in 2019. In the near term, the BJP is desperate to retain its control over the municipalities in Delhi that are to go to the polls soon. The state government is run by a new opposition party called AAP and chief minister Arvind Kejriwal frequently complains that the Prime Minister does not allow him to function. He is one leader who replies to Modi in Modi’s language. Power even in the local bodies matters to Modi. And he would like to clip the Delhi Chief Minister’s wings. He will help his party in every way possible even if he does not take time off from his Prime Ministerial duties to lead the BJP’s municipal poll campaign! BJP gets majority in Uttar Pradesh. Kolkata, India, March 11, 2017. NurPhoto/SIPA USA/Press Association. All rights reserved.